Last month, I have written about “Snoopy’s Street Fair” event coming on November 24th. It highlights the collection that celebrates the prestige icon we all grew up to love and incorporating that to kids’, preteens’ and the much-awaited teens’ outfits. Dressing up your kids stylishly and comfortably has never been this easy with the wide-range of premium items that our Snoopy stores could offer. Not to mention that it is so unbelievably affordable with tops ranging from Php199 to Php599, bottoms ranging from Php199 to Php899 and sets ranging from Php599 to Php999. Now, here is the fun part! You can take part in this fun-filled event by simply purchasing Php1,000 worth of Snoopy clothes nationwide or Php1,500 worth of items from Glorietta’s participating stores. It’s that easy! 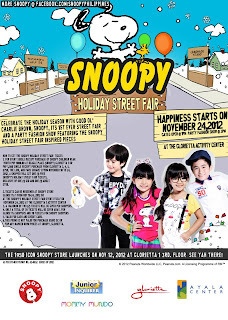 Just redeem your tickets by presenting your receipt at our newly opened Beagle Place (Snoopy) store at Glorietta 1 or at the New Glorietta Activity Center on November 24, 2012. In addition, loyal readers of my blog can also score to the Snoopy Holiday Street Fair. Up for grabs are tickets for two (2) lucky winners! Each ticket is inclusive of one (1) kid and one (1) adult stub. 5. Comment on this post with your name, e-mail address, Twitter ID, Facebook name, GFC & links to your Twitter and Facebook posts. 6. Deadline of entries is on November 15, 2012. Important reminders: Make sure to follow ALL steps. Skipping any steps will render your entry invalid. Set all your posts to PUBLIC. If not, we won’t be able to see your entry. NO double entries. If you comment more than once, your entry will be considered null and void. Winners will be chosen at random via Raffle.